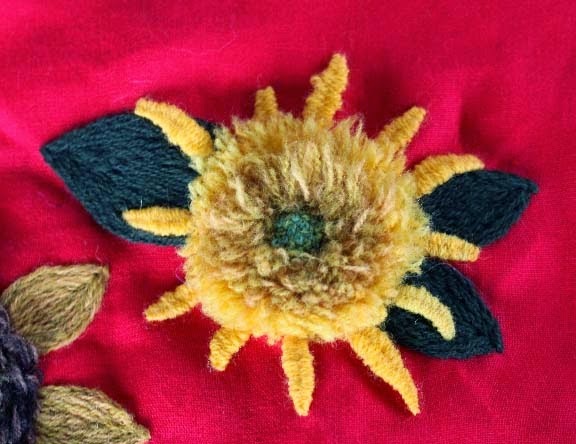 This is the second in a series of sunflower inspiration for a crewel work embroidery piece. I began this piece last year, during the summer Farmers Market in Northampton. See the first post here. 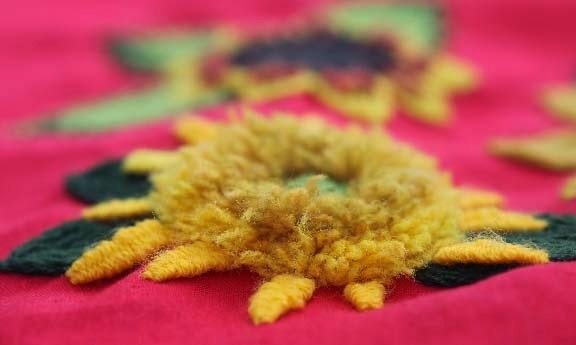 The second sunflower I stitched was inspired by the Sungold and Greenburst varieties. I have been growing Sungolds for years. They are long season flowers - taking 90 to 110 days to mature. The stalks are covered with blooms. 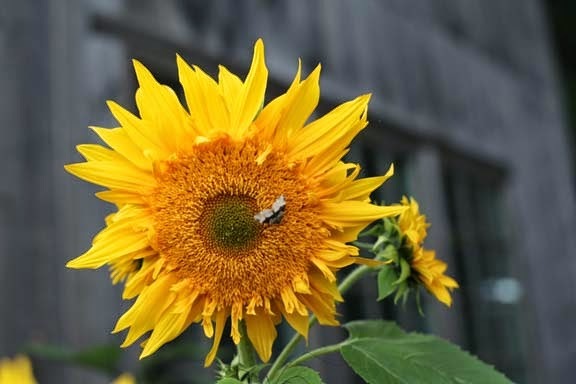 The Greenburst Sunflower was new to me last year and I am definitely going to plant them again. 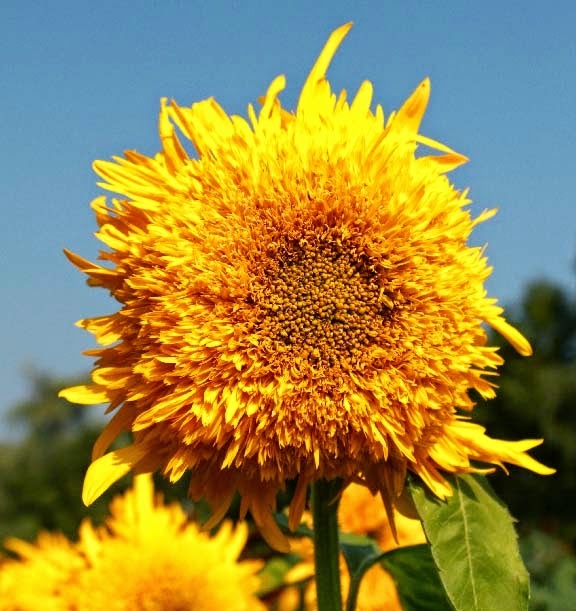 They are similar to Sungold but are quick to bloom. On both of these varieties, there will be a huge top flower and smaller branching flowers below. Some people call these very fluffy sunflowers Van Gogh Sunflowers as Vincent loved to paint them and helped to make sunflowers the iconic flowers they have become today. This sunflower was really fun to stitch. I blended different colors of yellow and gold to give a natural shaded look to the flower. I used turkeywork stitch for the fluffy outer ring. 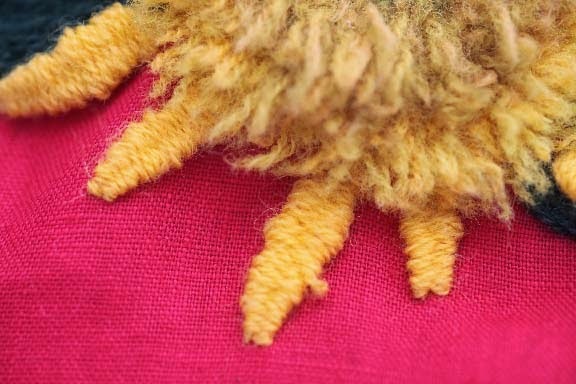 It is a looped stitch which I then cut to mimic the fluffy sunflowers. Isn't the sculptural quality of the turkeywork beautiful? For the petals, I chose Needleweaving to approximate the long thin petals. I love this stitch because it is so sculptural and again - a fun stitch to do. 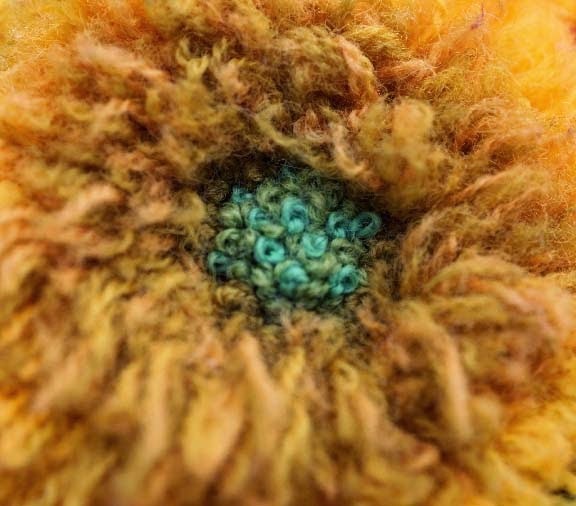 For the center, I blended two colors of green to resemble the center of the Greenburst sunflower and worked French knots to resemble the small bits of this pretty sunflower. This flower was so much fun to make. I used the Crewel Wool Thread that is available on my website here. The background fabric is pure linen which is also available on my website in 10 beautiful colors. 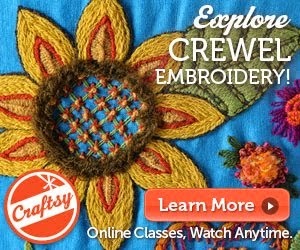 All Crewel Embroidery is fun - I must admit. Although not all my work is as representative of nature, this project was. As I stitched each week, I couldn't believe the number of passerby's who stopped to chat - telling me about someone in their lives who used to stitch and embroider. Stitching in public is a good thing to do because it causes people to stop, chat, and remember. And maybe I can cause the person to pick up a needle and thread too. I hope your week goes great. Have you heard about this study? 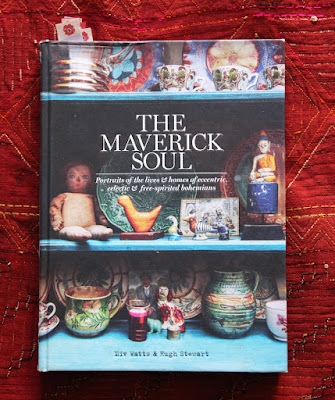 It connects the crafts and art to good health later in life. Cool. Love it!! Thanks for the info and incentive! Lovely post; my favorite flower! Nickycarp -- I hope you give it a go! You will love it.